Werner Stieger was a partner from 1994 to 2016 and is now senior counsel of Homburger’s IP and IT and litigation and arbitration practices. 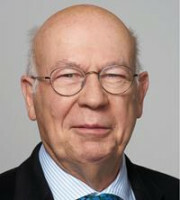 He has vast experience in giving advice to and representing clients in the field of patents (including supplementary protection certificates), as well as copyright, trademark, IP rights, unfair competition and technology-related litigation and arbitration in a broad range of technical and industrial fields and within international contexts. He is also experienced in negotiating and drafting IP-related contracts. Since the 1980s he has represented numerous Swiss and foreign entities in civil litigation and arbitration proceedings, including F Hoffmann-La-Roche AG, Novartis Pharma AG, Sandoz AG and Acino Pharma AG. Mr Stieger was a member of the board of the Institute for Intellectual Property Law and the Swiss Forum for Communication Law. He was one of the editors of sic!, the Swiss journal for IP, information and competition Law. He is a member of the International Association for the Protection of Intellectual Property and the Zurich and Swiss Bar Associations. Mr Stieger is the author of numerous publications on IP law, in particular patent law and procedural law. He has published or edited several books and articles. He was also a lecturer in patent law at the Swiss Federal Institute of Technology in Zurich and the University of Zurich.